This is our review of the Park Hyatt Zurich hotel. We spent last weekend in Zurich, visiting some friends who were transferred there. 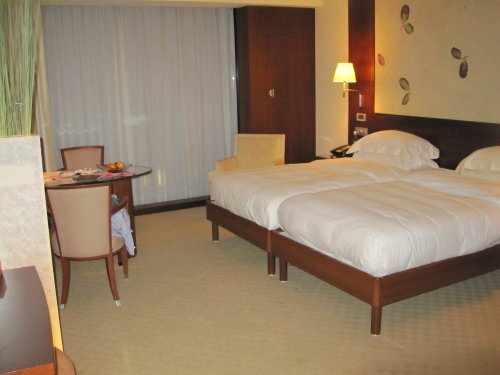 We stayed at the Park Hyatt hotel in Zurich which is seen as one of the Hyatt flagship properties. (It is one of only seven hotels to be in the new super-expensive Category 7 for Hyatt Gold Passport redemptions.) On this basis, Park Hyatt Zurich seems worthy of a Head for Points review. Clearly, we could have done the trip more cheaply. In fact, we could have done it for nothing via the Crowne Plaza or Four Points on points. 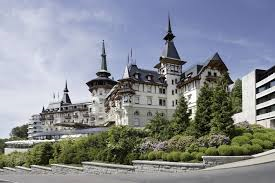 However, Zurich is expensive however you do it, and the gap between the good and average came down quite a bit with Hyatt’s special family deal. We got a second, connecting room for children for a 65% discount, plus free breakfast and a 4pm check-out on Sunday. This deal is not available via the Hyatt website. You need to spot it on the hotel website and then call them directly to book. It brought the cost of the 2nd room for the kids down to CHF 245 which, for Zurich, is astonishingly reasonable. The bedrooms were surprisingly large for a European city centre hotel, as you can see below (these are my own pictures). All the usual bells and whistles you would expect at this level were present and correct. The most interesting point was the doors in the bathroom which open up – you can see the bath behind the bed in my shots. Little things worked well, which is a key mark of a high-end hotel. For example, the connecting doors between our two rooms opened to 180 degrees, flat against the wall. You wouldn’t believe how many hotels have connecting doors which do NOT open to 180 degrees, making it very difficult to manoeuvre around the room. On the downside, the ’50 Shades of Beige’ colour scheme was muted, to say the least. The kids room also had a definite smell of smoke in it. All in all, the rooms worked well. The hotel corridors were also amazingly wide and had windows on one side, making them far lighter than usual. We only ate breakfast at the hotel, so can’t comment on the (very fancy looking) restaurant and bar. Breakfast was not ideal, to be honest. There is no formal dining area – seating is bar-like, with comfy chairs arranged around low tables. Not ideal for kids, and indeed not ideal for eating certain things. The modest size of the hotel was also reflected in the modest buffet, although cooked items were available – and were included in our ‘free breakfast’ package. We would stay here again – it got my wife’s seal of approval. It is not as good or as noteworthy as the Four Seasons Geneva, though, which we enjoyed a few years ago. For a longer stay, though, I think we would try the Dolder Grand (photo below) on the edge of town, which is a genuine landmark property as you can see. 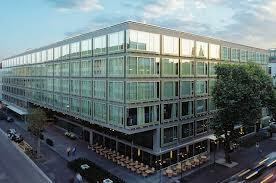 Sheraton is also about to open a brand new property in Zurich, which may be worth a look. You can find out more about the Park Hyatt, and book, on the Hyatt website here. Downtown Zurich has many hotels but few points-earning, the Hyatt among them. 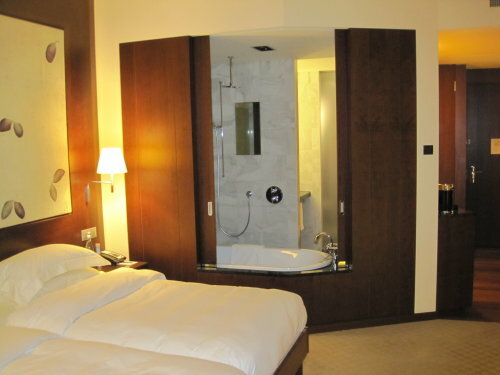 As you say, you could have used IHG points to stay in Zurich, but not in the city centre. IHG is surpringly poor in its Zurich offerings. The Crowne Plaza – once, absurdly, an InterContinental – is in Altstetten, a 20-minute tram ride from the centre. There are some HIs and HIEs away from the centre and near the airport. Hardly a great choice. Good to see news of a new Sheraton to accompany the Neues Schloss http://www.starwoodhotels.com/sheraton/property/overview/index.html?propertyID=118 ; Sheraton once operated the Sheraton Atlantis. which we used for entertaining, my only opportunity at the time to earn SPG points in Zurich. Yes, given my points mountain I do not voluntarily pay for hotels in expensive cities, but had little choice here. However, when driving to our friends, we passed a Four Points which appears to be built into a shopping mall. Not sure what the quality level is like but having shops on the doorstep would have been handy, especially as Sunday was a rare ‘shops open’ day. We went out to the wildlife park on Sunday, fascinating. Got a great video of two bears having an all-out wrestling contest! I see that SPG are now tweeting about their new property in Zurich. In Zuerich, I’ve only stayed at the Baur Au Lac http://www.bauraulac.ch , based on an experience of great service at another of the “Leading Hotels of the World”. I would only recommend it for its fantastic position in the city. The service was far too snobby and the room wasn’t great. Looking at awardmapper, it is weird the way that the main chains have stayed out of the centre. Good review thanks! I live in Switzerland, so I might drop in here next time I’m in Zurich to check it out. 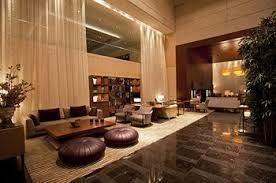 Hi, I will be in this Hyatt in a few days. Is any room with a nice view there? How was Christmas market in Zurich? What your kids enjoy there? Hmmm …. can’t help you much, I’m afraid! Views are not great, as you can see the hotel is low rise and faces into other office buildings on all sides (one side is actually facing a construction site!) Didn’t get to the Christmas Market because we were with friends for the weekend. The hotel has very little for kids. However, if you have access to a car, go here – http://www.zuerich.com/en/Visitor/Experience/Nature/Wildnispark-Langenberg.html – the wildlife park, which is amazing. We have this great video of two bears having a stand-up wrestling contest for about 5 minutes. Basically, they have fenced off a pile of woodland and reintroduced loads of bears, reindeer, foxes, wild goats etc. Note that a taxi from the airport, whilst it isn’t far from the centre, will cost you $60-$70 (£40). Welcome to Switzerland! Try eating at http://www.hiltl.ch/website/. I love it! IIRC the Hotel Widder became rated more highly than the Baur au Lac. Favoured by bankers and high industrialists although my knowledge is not totally recent. Even though the Baur au Lac is no slouch. At one time the Movenpick in the centre got better than expected ratings from some very fussy people I knew.